In a large pot, heat the olive oil over medium heat. Toss the meat with the flour and brown it in the oil. Set aside. In the bottom of a slow cooker place the potatoes, carrots, and onions. Place the meat on top of the onions. 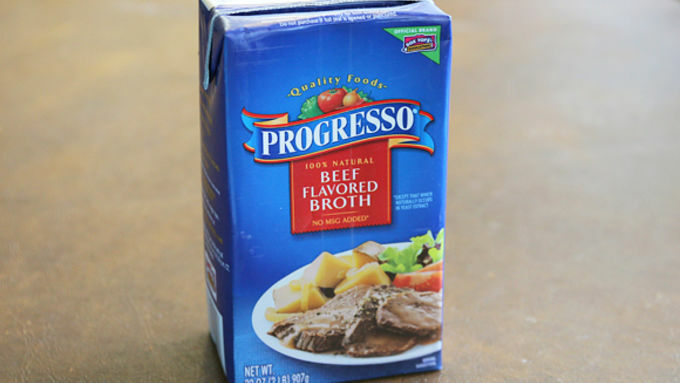 Combine the tomato paste, beef broth, Italian seasonings and garlic and pour over the beef and vegetables. Cook on low for 6-8 hours or until potatoes are done. For the last half hour of cooking combine the cornstarch with the water until a paste is formed, then stir it into the stew. Cook on high for a half hour or until stew has thickened. Add salt and pepper to taste and serve. 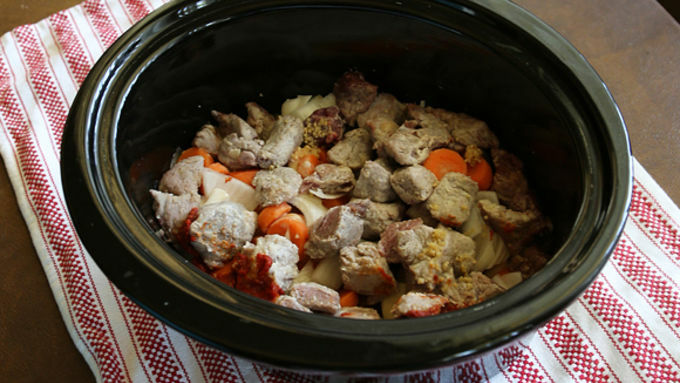 The perfect St. Paddy's Day meal: Irish stew made the easy way -- in your slow cooker! St. Paddy's day always has me thinking about all things green and Irish. 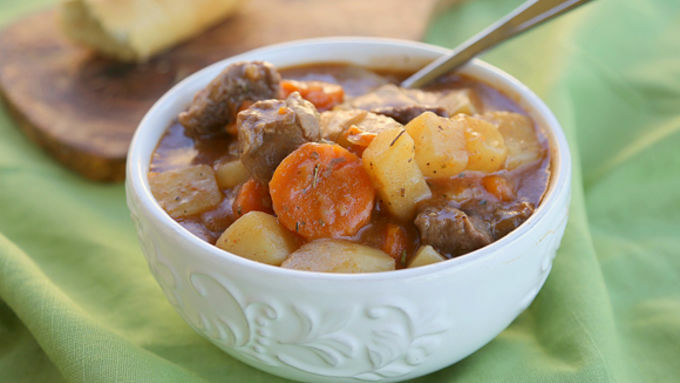 This Slow Cooker Irish Stew isn't green, but it has the simple comforting ingredients that make a savory Irish stew. It's one of those recipes that you can prepare in the morning and then forget about all day until you come home to a delicious aroma in your kitchen. You want to start with either lamb or beef cubes of meat. 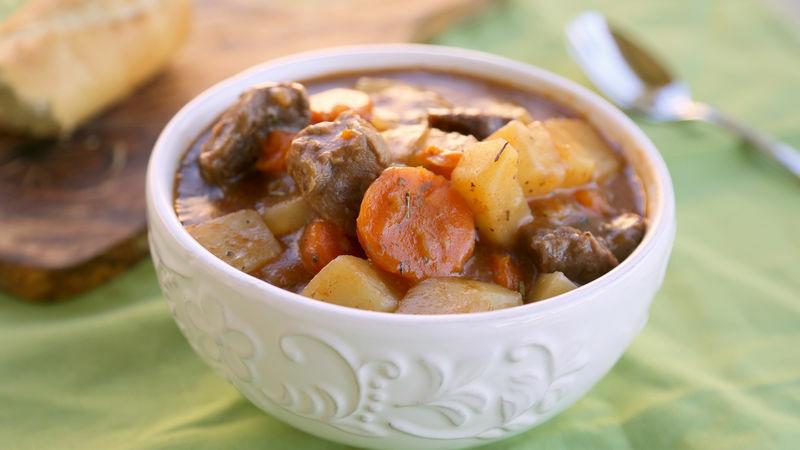 I think in a true Irish stew you want to use lamb, but I used beef here because it's what I preferred. The secret to bringing out the flavor in the meat is to toss it with a little flour and brown it in some olive oil to sear the edges before putting it in your slow cooker. I love that this meal only takes twenty minutes in the morning to prepare -- and at the end of the day, you have a warm comforting meal your whole family can cozy up to. Enjoy with some warm crusty bread!